Search Results for "lion eating"
United States, 1940s: Lion eating a piece of meat from a wooden post. 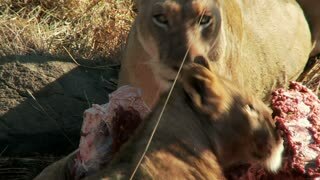 Male lion in cage grabbing chunk of meat. Man eating meat at a dining table. 1940s: Stick puts meat into tiger's cage. Lions move aggressively inside cage. 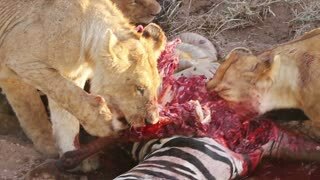 Stick puts meat into lion’s cage, lion eats. Monkeys move aggressively inside cage. Lion tamer speaks to lions. 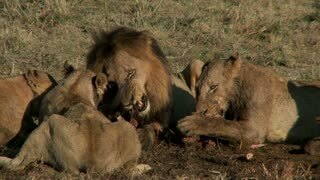 Pride Lions Eating. 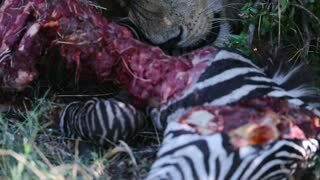 A pride of lines are feasting on a corpse of a wildebeest. 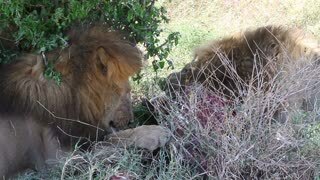 The male lion stands watch as the female lioness and cubs eat.